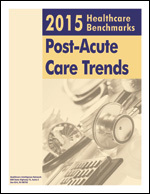 When it comes to transitions between inpatient, post-acute, and home environment settings, nearly three quarters (71%) of the NEJM Catalyst Insights Council respondents to its Care Redesign survey on Strengthening the Post-Acute Care Coordination believe that improved real-time communication is the biggest opportunity to improve post-acute transitions. Survey results are highlighted in a new infographic by NEJM Catalyst. 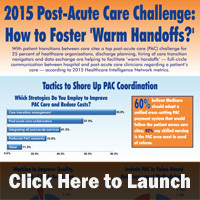 The infographic also examines other strategies for improving post-acute care transitions. Hospitals can’t just leave patient care to chance after patients leave the hospital. They must be more actively involved in managing their patients to ensure that they will receive the most appropriate post-acute care and avoid readmissions, according to a new infographic by eviCore healthcare. The infographic examines the components of the post-acute healthcare market, guidelines for avoiding unnecessary readmissions and strategies for modernizing post-acute care. A tri-county, skilled nursing facility (SNF) collaborative in Michigan is holding the line on hospital readmission rates for the three competitive health systems participating in the program. Henry Ford Health System, Detroit Medical Center and St. John’s Providence, along with the state’s Quality Improvement Organization (QIO), MPRO, developed standardized quality reporting metrics for 130 SNFs in its market. 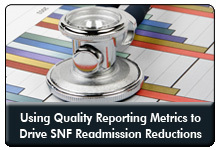 The SNFs, in turn, enter the quality metrics into a data portal created by MPRO. During Reducing SNF Readmissions: Quality Reporting Metrics Drive Improvements, a 45-minute webinar on May 11th at 1:30 p.m. Eastern, Susan Craft, director, care coordination, family caregiver program, Office of Clinical Quality & Safety at Henry Ford Health System, will share the key details behind this collaborative, the impact the program has had on her organization’s readmission rates along with the inside details on new readmission reduction target areas born from the program’s data analysis. As post-acute care costs increase, now accounting for $1 out of every $4 spent by Medicare Advantage plans, health plans are focusing on post-acute care management, according to a new infographic by CareCentrix. 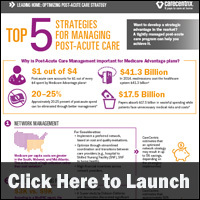 The infographic examines the top five strategies healthcare organizations are using to manage post-acute care. 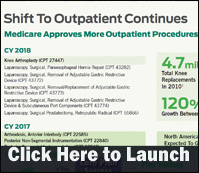 Medicare’s proposed payment rates and quality programs for skilled nursing facilities (SNFs) for 2017 and beyond solidify post-acute care’s (PAC) partnership in the transformation of healthcare delivery. 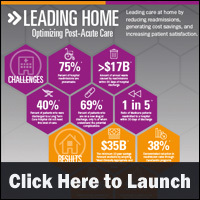 Subsequent to the Improving Medicare Post-Acute Care Transformation Act of 2014 (IMPACT Act), forward-thinking PAC organizations realized the need to rethink patient care—not just in their own facilities but as patients move from hospital to SNF, home health or rehabilitation facility. 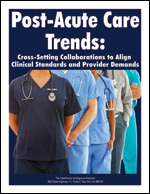 Post-Acute Care Trends: Cross-Setting Collaborations to Align Clinical Standards and Provider Demands examines a collaboration between the first URAC-accredited clinically integrated network in the country and one of its partnering PAC providers to map out and enhance a patient’s journey through the network continuum—drilling down to improve the quality of the transition from acute to post-acute care. UTSACN used data analytics to trim its home health network from more than 1,200 agencies to 20 highly efficient home health providers. How does UT Southwestern Accountable Care Network (UTSACN) use information to inform and advance care coordination programming? As UT Southwestern’s Director of Care Coordination Cathy Bryan explains, a closer look at doctors’ attitudes toward a Medicare home health form initiated a retooling of the ACO’s home health approach. We realized our home health spend was two times the national average. When we reviewed just the prior 12 months, we identified more than 1,200 unique agencies that serviced at least one of our patients. 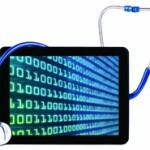 With this huge number of disparate home health agencies, it was difficult to get a handle on the problem. Our primary care doctors told us they found the CMS 485 Home Health Certification and Plan of Care form to be too long. The font on the form is four-point type; it’s complex, so they don’t understand it. However, because they don’t want a family member or patient to call them because they took away their home care, they often sign the form without worrying about it. As we began looking at these findings, we wondered what they really told us. Are some agencies better than others, and how do we begin to create a narrow network or preferred network for home care? We knew we couldn’t work with 1,200 agencies efficiently; even 20 agencies is a lot to work with. We began to analyze the claims. My skilled analyst created an internal efficiency score. She risk-adjusted various pieces of data, like average length of stay. For home health, there were a number of consecutive recertifications. We looked at average spend per recertification, and the number of patients they had on each agency. We risk-adjusted this data, because some agencies may actually get sicker patients because they have higher skill sets within their nursing staff. We created a risk-adjusted efficiency score based on claims. We narrowed down the list by only looking at agencies with 80 percent or higher efficiency. That left us with about 80 agencies; we then narrowed our search to 90 percent efficiency and above, and still had 44. That was still too many, so we cross-walked these with CMS Star ratings to narrow it even more. Finally, after looking at our geographic distribution for agencies that serviced at least 20 patients, we eliminated those with one and two patients. We sought agencies that had some population moving through them. Ultimately, we reduced our final home health network to about 20 agencies that were not creating a lot of additional spend, and not holding patients on service for an incredibly long period of time. 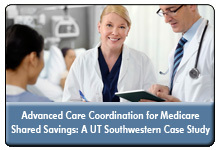 During Advanced Care Coordination: Bridging the Gap Between Appropriate Levels of Care and Care Plan Adherence for ACO Attributed Lives, a 2016 webinar available for replay, Cathy Bryan, director, care coordination at UT Southwestern, shares how her organization’s care coordination model manages utilization while achieving its mission of bridging the gap from where patients are to where they need to be to adhere to their care plan. Seventy-five percent of hospital readmissions are preventable—more than $17 billion annually is wasted due to readmissions within 30 days, according to a new infographic by CareCentrix. The infographic lists four keys to success in improving post-acute care and reducing readmissions.